Many licensed Cannabis distributors in California are under the mistaken impression that there is a testing "grace-period" until July 1st, 2018. 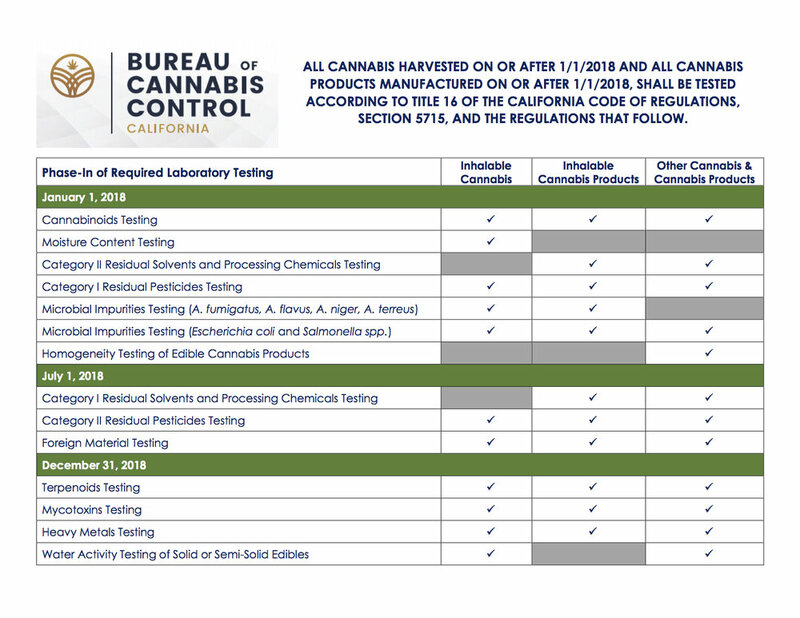 The Bureau of Cannabis Control would like us to remind our clients that testing is now mandatory for all Cannabis and Cannabis products that were not in a licensee's possession of at time of licensure. We now offer compliance sampling and testing. Give us a call at 510-545-6984 and ask to speak with our sampling team! CW Feature: Wired "The Dirty Secret of California's Cannabis"
CW Analytical was recently featured in Wired's article and news video on the dangers of dirty cannabis. Watch below to learn more, and visit the link below to read the entire article. We are altering our normal operating schedule to allow our extremely hard working team to spend time with their families, as well as complete important equipment maintenance over the holidays this year. Please see the calendar below for more information. We will stop accepting samples for Microbiological Screening on Wednesday, December 20th through Tuesday, December 26th.We will be accepting samples for all other tests until 1pm on December 21st. After 1pm, our office will be closed for sample drop-off and sample pick-ups through end of day, December 26th. We will be closed Monday, January 1st. We understand that we are an important part of your quality assurance program, so please plan accordingly, and let us know if you have any questions. We deeply appreciate your business and your understanding. Happy Holidays from the CW Analytical team! Come Inside CW Analytical at the NCIA Cannabiz Conference June 12th, 2017! We're excited to announce that for the second year in a row, we will be offering tours of our laboratory to NCIA conference attendees at 10:30am, 1:00pm and 3:30pm on Monday June 12th, 2017. While the first two tours are already sold out, there are still sign-ups available for the 3:30 tour. If you're interested in seeing some of the upgrades and fancy new pieces of equipment we've got in-house, get on the list! We'll also have an Orange Photonics LightLab (portable Cannabis potency testing device) set-up for viewing. We'll be announcing an exciting partnership with Orange Photonics in the coming days.